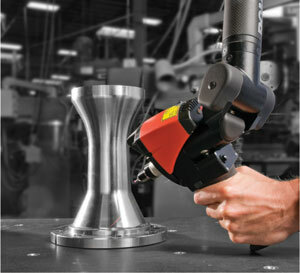 RS1 Integrated Scanner - CMM Inc. The RS1 Integrated Scanner simply makes 3D measurement easier and faster. With this portable CMM, user productivity is amplified and measurement time is substantially decreased (compared to older models). The RS1 Integrated Scanner is designed for manufacturing and engineering within automotive, aerospace, medical, rail and energy production industries. This is the perfect solution when you need to inspect, measure or reverse work pieces in a short amount of time. The RS1 requires no warm up time, allowing the user to get started on their project right away. The arm also requires no homing procedures and the automatic probe recognition allows the operator to go from scanner to ball probes without additional calibration. Scanning control and batteries are incorporated into a feature pack, making this portable CMM unit completely self-contained. The RS1 is factory calibrated and certified to B89.4.22 as a complete unit with the ROMER 7 axis arm.